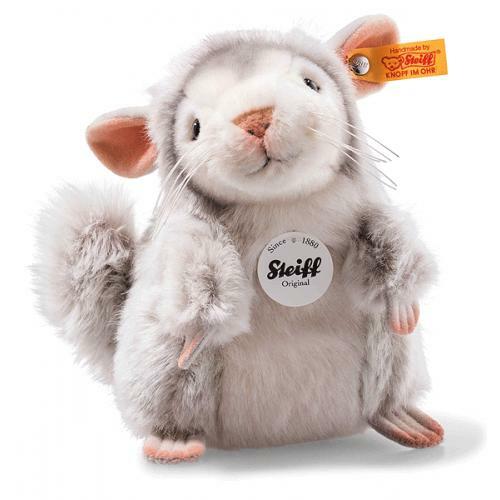 Protect Me Chinchi Chinchilla is hand made in the finest grey and white cuddly soft plush. This is Chinchi, an 18 cm tall chinchilla from the Protect Me series. The natural habitat of this cute little rodent extends across the Andean states of Peru, Bolivia, Chile and Argentina in South America, where it lives in mountainous regions. Due to its extremely soft fur, this animal is hunted extensively in the wild and is at risk of extinction. The risk is made even worse by the fact that the animal is captured and kept as a pet. Chinchillas are exported and sold around the world to owners who keep them in cages. Inspired by the beauty of his real-world counterpart, Chinchi is made from incredibly soft plush fabric in grey/white. The brown facial features with beautiful grey shading as well as pinkish inner ears and nose centreline work together to form his adorable little face. His little pink paws stick out from under his cream-coloured belly. His white whiskers just make children want to pet and pat him that much more.